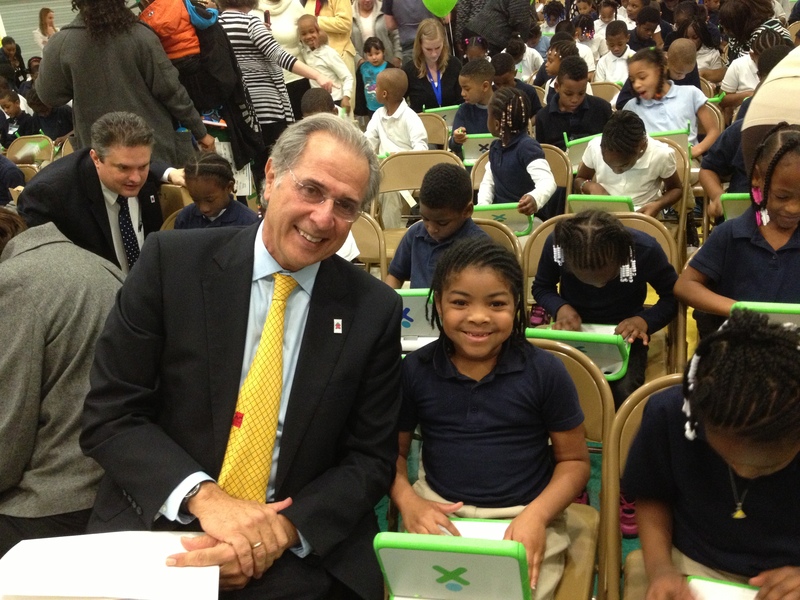 The OLPC project is alive and well in The Queen City. WHO: The James L. Knight School of Communication is launching a digital literacy initiative at Ashley Park Elementary School, a school within the Project L.I.F.T. corridor. Project L.I.F.T. is a non-profit organization that transforms the way students who traditionally perform poorly in school are educated, focusing on nine schools within Charlotte Mecklenburg Schools (CMS). WHAT: The Knight School has partnered with CMS, One Laptop per Child, Mobile Beacon and EveryoneOn to clear away digital literacy obstacles for Ashley Park Elementary families and assist parents who cannot keep pace with the technological literacy required of their children. The Knight School will assess families’ technology needs; Mobile Beacon is donating 100 modems and is providing free in-home Internet access for the remainder of the school year to participating families; and One Laptop per Child has already provided students with computers. The initiative aligns with the Knight School’s overarching mission—to raise the digital media literacy rate of the city to improve the lives of Charlotteans—and the launch day will be celebrated by a Mayoral Proclamation. WHY: The focus on Ashley Park Elementary follows the Knight School’s Digital Media Literacy (DML) Index, the first tool of its kind to produce a comprehensive view of DML competency across a municipality—in this case, the city of Charlotte. The community surrounding Ashley Park scored the lowest on the Knight School’s Charlotte area index; a deeper look at the data revealed the neighborhood has the lowest Internet use, contains the highest percentage of adults without a high school degree and has the highest percentage of households with an annual income less than $40,000. The mission of the James L. Knight School of Communication is to prepare consumers and creators of communication messages to become engaged citizens, advocates and leaders in the communities they serve. The Knight School offers a Bachelor of Arts with a major in Journalism and Digital Media, a Bachelor of Arts with a major in Communication, and a Master of Arts in Communication. Alumni thrive in such areas as journalism, media industries, advertising, public and community relations, law, human resources, sports enterprise, corporate communication, government and education. Queens University of Charlotte is a private, co-ed, Presbyterian-affiliated comprehensive university with a commitment to both liberal arts and professional studies. Located in the heart of historic Charlotte, Queens serves approximately 2,400 undergraduate and graduate students through its College of Arts and Sciences, McColl School of Business, Wayland H. Cato, Jr. School of Education, James L. Knight School of Communication and Andrew Blair College of Health which features the Presbyterian School of Nursing. Mobile Beacon provides fourth generation (4G) mobile broadband services exclusively to educational and nonprofit organizations across the United States. Mobile Beacon was created by a 501(c)3 nonprofit organization that is one of the largest national educational broadband service (EBS) providers in the country. Through an agreement with Clearwire, Mobile Beacon provides high-speed data services and mobile Internet access on the CLEAR 4G network. For more information, visit www.mobilebeacon.org. EveryoneOn is a national nonprofit working to eliminate the digital divide by making high-speed, low-cost Internet, computers, and free digital literacy accessible to all unconnected Americans. EveryoneOn aims to leverage the power of the Internet to provide opportunity to all Americans—regardless of age, race, geography, income or education level. For more information, visit www.everyoneon.org. One Laptop per Child (OLPC) is a non-profit organization whose mission is to provide every child in the world access to new channels of learning, sharing and self-expression. In partnership with the public and private sectors and non-governmental organizations and supported by comprehensive implementation and pedagogical services, OLPC seeks to provide each child with a rugged, low-cost, low-power connected laptop that empowers individual learning and growth. Fore more information, visit www.laptop.org. Posted on March 21, 2014 February 20, 2016 Author marianaCategories OLPCTags charlotte, Knight Foundation, OLPC, Project L.I.F.T2 Comments on The OLPC project is alive and well in The Queen City. On May 29, 2013 several Charlotte Mecklenburg librarians received a first hand experience with the XO laptop. Due to an emerging partnership with Project L.I.F.T and the West Charlotte branch locations, the librarians are eager to assist elementary XO learners who live in this zone. These library locations include the West Boulevard, Beatties Ford Road and the ImaginOn branches, which are frequented by the students. Programs are being developed to support learning with technology at these locations. During the training, the librarians got the full experience of an XO learner in a one to one classroom. From opening the innovative laptop to creating work samples, exploration filled the fun packed hour. The librarians even got a chance to chat with each other with the laptops’ ad hoc networks. Using the Sugar platform exclusive to the XO laptop, communicating and sharing work is an available option to all XO learners. The staff was also impressed with accessibility options on the laptop including the free applications, multiple languages and the speak function, allowing students to hear words as they type passages. The session also included an introduction to coding, importing and creating media and downloading books to the XO laptop. The librarians are excited to welcome XO learners in the 2013-2014 school year. Plans are underway for workshops and XO dedicated spaces in the select West Charlotte library locations.